Names: Red Huckleberry is also known as Red Whortleberry or Red Bilberry. Parvifolium means small-leaved. Relationships: There are about 450 species of Vaccinium worldwide, about 40 in North America with about 15 in the Pacific Northwest. The genus Vaccinium includes Blueberries, Huckleberries, Cranberries, Lingonberries, Whortleberries, Bilberries and Cowberries. 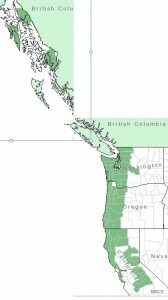 Distribution: It is found along the Pacific Coast from southeast Alaska to central California. 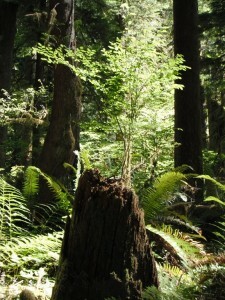 Mostly in the lowland forests west of the Cascades in British Columbia, Washington, and Oregon; the California coast, and the Sierra Nevadas. 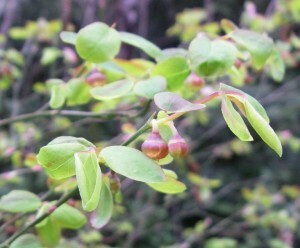 It is the most common Vaccinium in the Oregon coast mountain ranges. 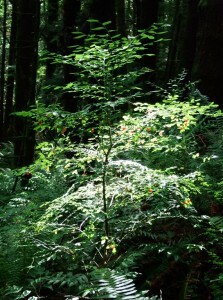 Growth: Red Huckleberry grows slowly up to 12 ft. (4m), usually growing only 3-6 ft. (1-2m). It is often found growing on top of decaying logs and stumps in open to fairly dense coniferous forests. Diagnostic Characters: It is most easily recognized when berries are ripe, being the only native upright Vaccinium with red berries. 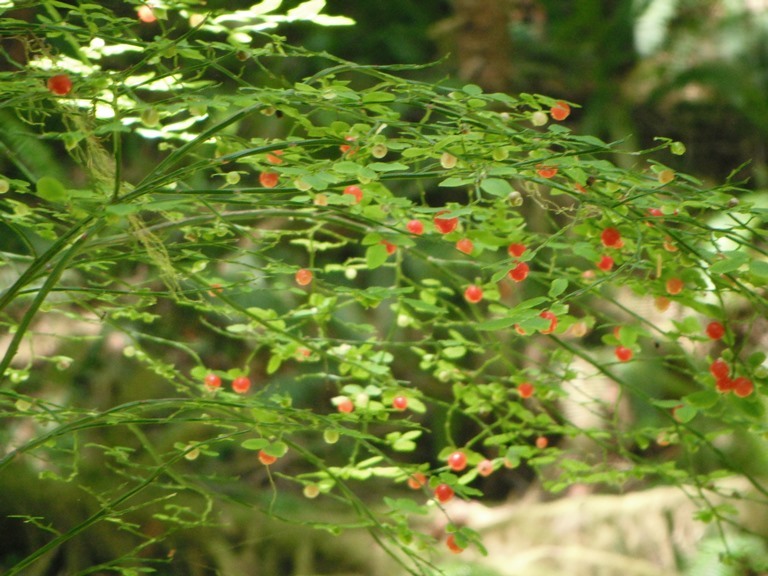 Its stems are finely branched, angular and usually bright-green but sometimes red. Its dainty leaves are small, oval and not toothed, some occasionally persist through winter. 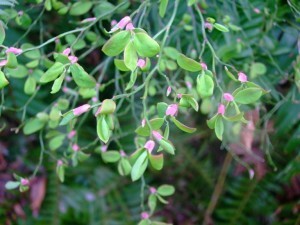 The greenish or creamy-pink urn-shaped flowers arise singly in leaf axils. 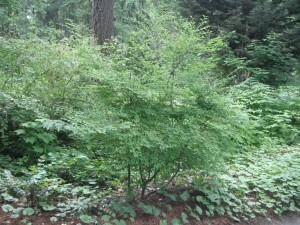 In the Landscape: Red Huckleberry performs best in a woodland garden which duplicates its native habitat in partial shade with rich, humusy soil. 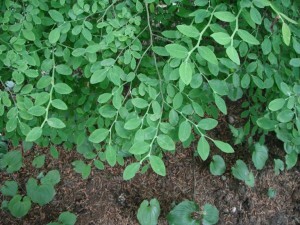 It is delicate-looking with an attractive branching pattern. In fall, its reddish leaves create an interesting visual contrast next to its green branches. Rhododendrons, Salal, Evergreen Huckleberry and ferns are good companions. Many attempt to duplicate the natural look of this charming plant perched on top of a rotting stump or log. The establishment phase of this endeavor is critical—the transplant must receive the proper amount of moisture; too much or too little will lead to certain death! Phenology: Bloom time: April-June; Fruit ripens: July-August. It is the only native upright Vaccinium with red berries. Propagation: Seeds require no special treatment, but in nature the digestive processes of animals may hasten germination. After sowing on a peaty, high-acid soil, seedlings begin emerging after one month and may continue germinating for a long time thereafter. Warm days (14 hours @ 82ºF (28ºC)) and cool nights (10 hours @ 56ºF (13ºC)) enhance germination success. Seedlings are small and may take a few seasons to mature before plants are large enough to plant out in the garden. Softwood cuttings may be taken in June, treated with IBA and stuck in a peat moss/sand media (2:1). 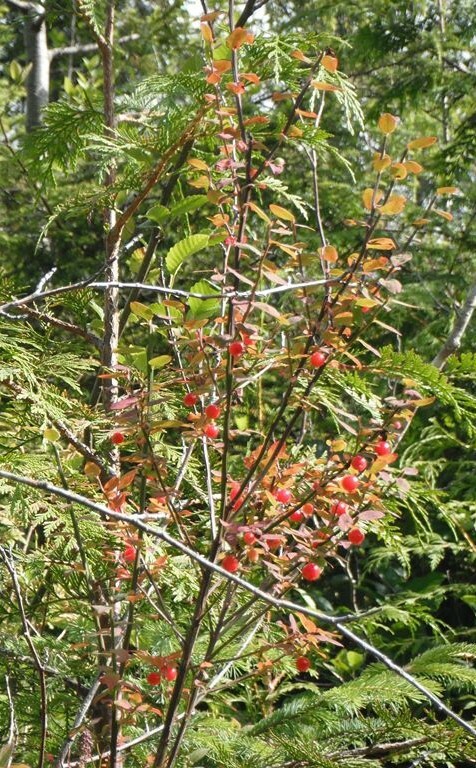 Use by People: Red Huckleberries were eaten fresh by all native tribes. The berries were often combed off the twigs and then the leaves were separated from the berries by rolling them down a rough, wet plank. Some tribes dried them singly or mashed them into cakes or stored them in oil. 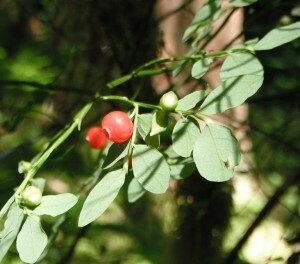 The berries, resembling salmon eggs, were used as fish bait in streams. Red Huckleberries are a good source of Vitamin C and many prefer their flavor over cranberries. The berries are sometimes used in pies, jellies, jams or preserves. Hikers consider them a great treat for a quick snack on the trail. The delicate twigs are sometimes used by florists. 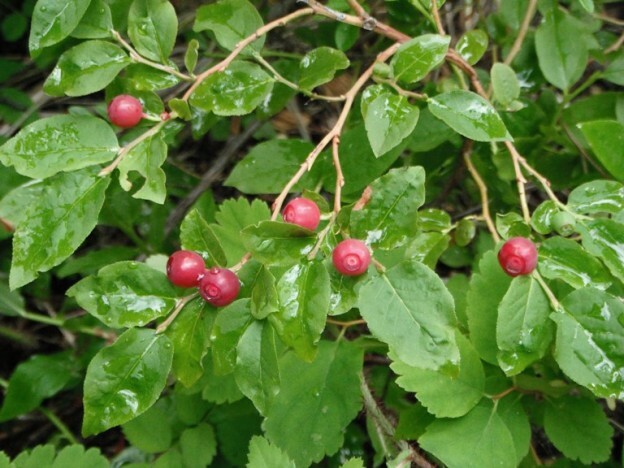 Use by Wildlife: As with all the other huckleberries and blueberries, Red Huckleberry is a favorite food of a variety of birds and mammals including thrushes, pigeons, towhees, ptarmigans, and grouse; and bears, raccoons, chipmunks, foxes, skunks and deer mice. The twigs and foliage are also an important browse for deer, mountain goat, and elk. Small mammals will also browse Red Huckleberry. It is a preferred food of Mountain Beaver. 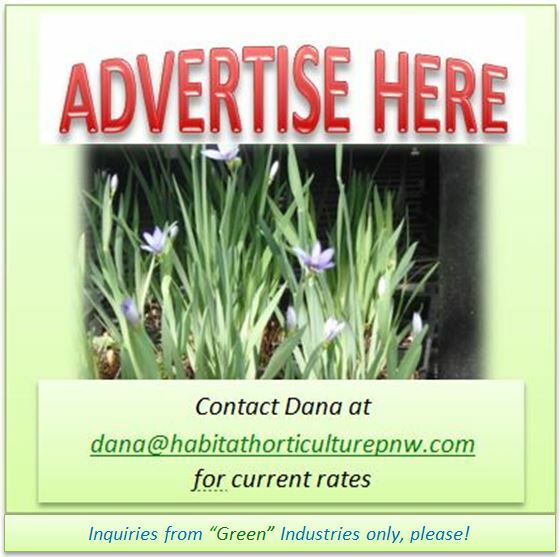 This entry was posted in Deciduous Shrubs & Vines on February 8, 2016 by habitatdana.